The charming village of St-Therese with excellent restaurent, of course the village of Mont-Tremblam, and hikes in the National Park. 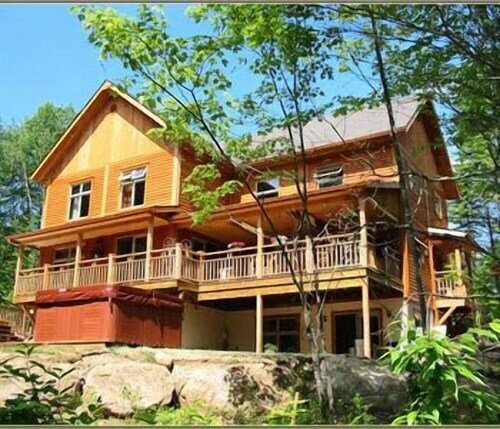 Located close to the North side of the Mont Tremblant mountain, this complex offers a unique and spectacular setting. The site is beautiful, close to St-Jovite downtown with its many restaurants, and about 15 minutes drive to Mont-Tremblant. 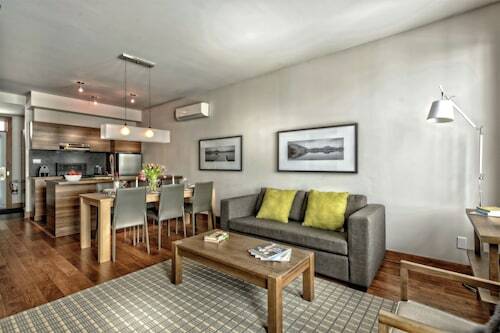 A shared kitchen with oven, microwave and pretty much anything you need is a big PLUS , comparing to other inexpensive hotels near Mont Tremblant. 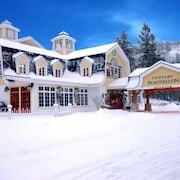 The hotel has the best location in Mont Tremblant - you can wear your ski boots anywhere in the hotel, pick up your skies from the valet storage service and just walk or ski to the lifts. Great location right at the base of the lifts. We had a great vie wolf the ski hill. Where to find Mont-Tremblant hotels near an airport? How can I find hotels in different Mont-Tremblant neighborhoods? Where can I find hotels in Mont-Tremblant that are near tourist attractions? 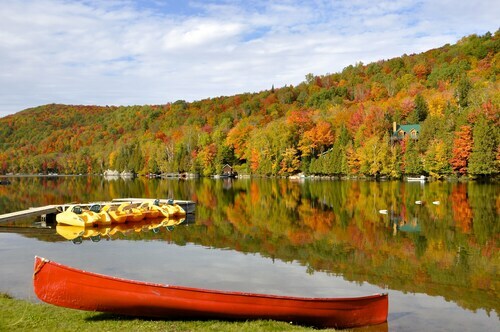 If you are searching for comfortable places to base yourself in Mont-Tremblant, you're simply spoiled for choice. Our accommodation section offers 65 hotels within 0.1 kilometres (0.06 miles) of Mont-Tremblant's center. Like to find a place close to the beating heart of Mont-Tremblant? The Le Grand Lodge Mont-Tremblant and Boréalis - Tremblant Resort Lodging are conveniently located a short distance of the city center. 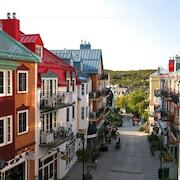 Mont-Tremblant Pedestrian Village is an accommodation area that is 4 kilometres (3 miles) from the heart of Mont-Tremblant and offers 11 hotels. Places to stay here include the Hôtel Quintessence and Sommet des Neiges. Another popular place to stay is Saint Donat. Saint Donat offers the La Tanière de l'Ours and Le Grand R. Or, try Saint-Faustin, where you'll find the Mont Blanc and Chalets Royal Laurentiens. The Auberge Villa Bellerive and Gîte le Coup de Coeur are located in Nominingue, and Les Jardins de L'Achillée Millefeuille and Auberge Le Cosy are part of the La Conception area. Of course, a visit to Mont-Tremblant wouldn't be complete if you don't make a visit to the Mont-Tremblant Ski Resort. The Les Manoirs - Tremblant Sunstar and Les Falaises Ski-in Ski-out Condo, are all within a 0.1 kilometres (0.06 miles) radius of Mont-Tremblant Ski Resort. Thrifty travelers can relax. 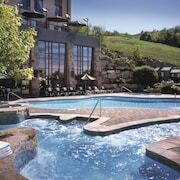 Mont-Tremblant offers a solid range budget hotels. 4 kilometres (3 miles) from Mont-Tremblant's downtown area is the La Place Saint-Bernard. 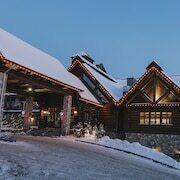 The Le Grand Lodge Mont-Tremblant is only 0.1 kilometres (0.1 miles) away. 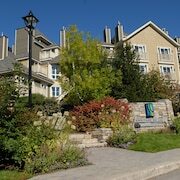 Alternative budget hotels are the Le Lodge de la Montagne - Les Suites Tremblant and the Les Jardins de L'Achillée Millefeuille. 2 kilometres (2 miles) away from downtown Mont-Tremblant, is the Rabaska - Tremblant Sunstar. 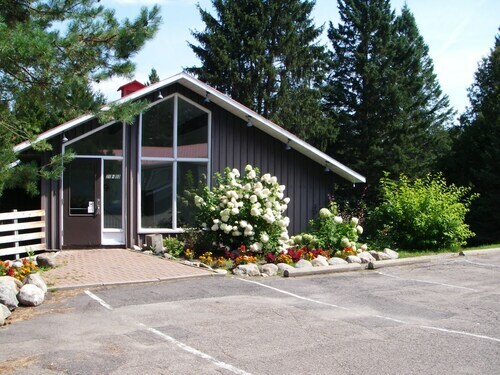 Alternatively, the Oasis - Tremblant Sunstar is situated 1 kilometre (1 mile) away. 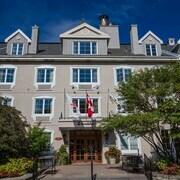 The Hôtel du Lac as well as the Le Westin Resort & Spa, Tremblant, Quebec are two other places to book accommodation in Mont-Tremblant. 90 kilometres (55 miles) away from Mont-Tremblant you'll find Joliette, where you can spend the day exploring Joliette Golf Club and Base de Roc Golf Club. The Hôtel Château Joliette and Motel Bonsoir are some of the great apartment and hotel alternatives in Joliette. 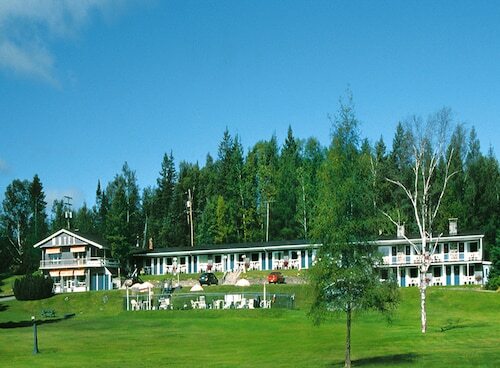 Or, you could consider staying in Lac-Saguay, 60 kilometres (36 miles) to the northwest of Mont-Tremblant, where you can choose from the Motel Ours Bleu and Motel Dodi. While visiting Lac-Saguay, set aside a little time to visit the Parc Georges Painchaud and Municipal Beach. Before you pack your bags for Mont-Tremblant, take the time to have a look through Expedia's Mont-Tremblant travel guide where you'll get the inside scoop the extensive attractions this great destination has to offer. Once you’re all checked in to your hotel, it’s time to explore. Put your adventure cap on and see what the city has to offer! From good eats to thrilling excursions, there are tons of things to do in Mont-Tremblant, and you can book them all right here on Expedia. 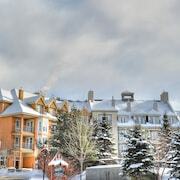 What are the most popular Mont-Tremblant hotels? Are there hotels in other cities near Mont-Tremblant? 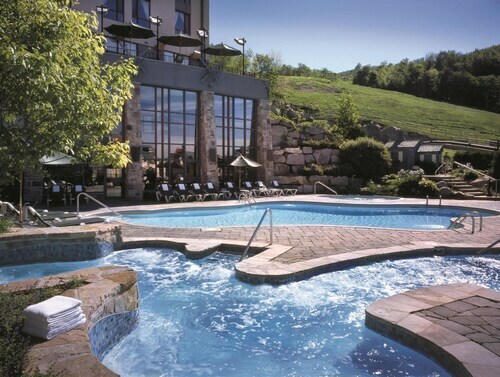 What other types of accommodations are available in Mont-Tremblant? Explore Mont-Tremblant with Expedia.ca’s Travel Guides to find the best flights, cars, holiday packages and more!